Repeatedly exposing children to diverse foods is an integral part in helping them to overcome those picky eater tendencies. 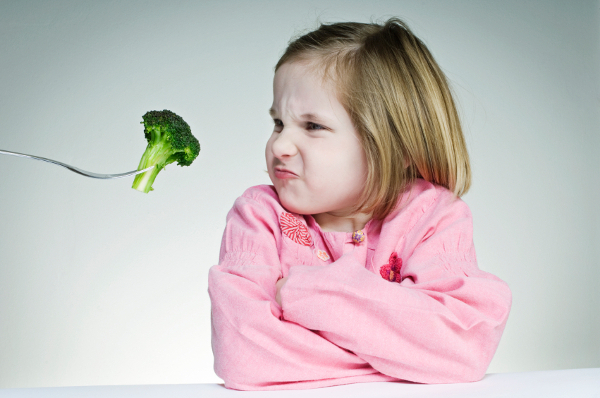 A study shows that kids can take up to 20 times of trying before they actually eat a new food. Many kids, however, don’t like these foods even when they are familiar with them. Believe it or not, this may have something to do with genes! Genes may play a role in picky eating due to the gene expression that can determine certain sensitivities to bitterness or sweetness and a plethora of other taste preferences. Avoiding the idea to force kids to eat things that they don’t like will probably yield you a lot more results in the end. Studies show that the parent that slightly influences their children’s eating and not the forceful approach raise more open-minded eaters. One way to promote healthy eating and alter eating habits is to eliminate unhealthy snacks and foods from the pantry or fridge. Keeping fresh fruits and vegetables as well as whole grain snacks will help to improve your children’s eating habits. Making these changes at an early age is important to the development of a healthy, non-picky eater. » They are around other children and will be more open-minded to try new things than at home. » Social cues from role models (counselors) will help to influence trying new things. » Being exposed to a variety of foods increases the likelihood of trying something new. » Having a cooking class or getting children involved in the preparation process and become more familiar with the food that they will eat. » Giving new foods fun names and pairing them with known favorites helps to increase the willingness of children to try them. One thing is for sure, food brings people together. Experiencing new things, overcoming fears, building on your strengths, having a curious approach, learning new skills, challenging your mind and breaking your routine are all things that promote growth and food surely plays an integral role in all of it. At Tastebuds, we believe that a great meal shared with new and old friends creates memories that can last a lifetime.